La Fototeca: Un riesgo para el anonimato - "International Meeting Place - Portfolio Review for Artists"
Un riesgo para el anonimato - "International Meeting Place - Portfolio Review for Artists"
¿Que pasaría si participaras en al menos dos de las revisiones de portafolios que seguimos compartiendo en el blog de La Fototeca? ¿Dónde estaría tu trabajo? 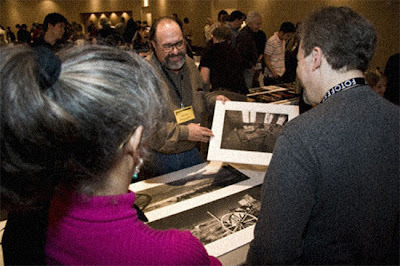 What would happen if you participated in at least two of the portfolio reviews we keep sharing here in La Fototeca's Blog? Where would your work be? Respira, y piensa. El mundo se vuelve del tamaño de la palma de tu mano. Breath, and think. The world suddenly becomes the size of your palm. En el marco de la Quinceava Bienal Internacional de Fotografía y Arte Relacionado con la Fotografía se celebra el "International Meeting Place - Portfolio Review for Artists" en Texas, durante marzo 2014. Los evaluadores son "curadores de museo, galeristas, editores de revistas, representantes de agencias fotográficas, coleccionistas y publicistas." Within the framework of the Fifteenth International Biennal of Photography and Photo Related Art there's the "International Meeting Place" in Texas, during march 2014. "Meeting Place Reviewers are museum curators, gallery owners, magazine editors, representatives of photography agencies, collectors and publishers." Si tuvieras la oportunidad de presentarle tu trabajo a ellos, ellos, ellos o a ellos pondrías en riesgo tu anonimato (vé y revisa las bios de los evaluadores). "Son cuidadosamente elegidos por su abilidad y disposición a ayudar artistas a desarrollarse en sus carreras con exhibiciones, publicaciones y guianza." If you had the chance to present your work to them, them, them or them you would put your anonymity (go and review the bios of the reviewers). "They are carefully selected for their ability and willingness to help artists to develop their careers with exhibitions, publications, and guidance for future career development." Un riesgo que te puede favorecer en maneras inimaginables. A risk that can favour you in unimaginable ways. Half of the job is the concept and shoot. The other half is taking your work to travel the world (with which we can help). Aprender a presentar tu trabajo con el Programa Artístico Desarrollando un Vocabulario Visual de La Fototeca. Unirte a su newsletter para mantenerte informado del International Meeting Place. Learn to present your work with the Artistic Program "Developing a Visual Vocabulary"
Join their newsletter to keep in touch with the International Meeting Place. ¿Te interesa ser parte del International Meeting Place? o de la Nueva Generación de La Fototeca?